ZTE is all set to launch a new smartphone under its Nubia line-up, at the upcoming IFA 2016. The company has sent out media invites for a launch event, scheduled for August 31. The invite reads ‘Dream without Boundaries,’ which likely hints at a bezel-less handset. 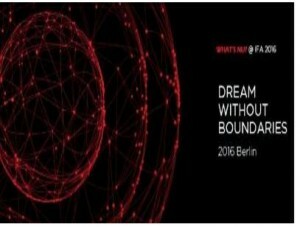 Along with this, there’s another teaser that says, ‘What’s NU at IFA 2016’. Recently, ZTE unveiled its Nubia Z11 smartphone at MWC Shanghai. The handset features a 5.5-inch Full HD display of 1080×1920 pixel resolution. It has a 2.5D curved glass bezel-less display with 81% screen-to-body ratio. The Nubia Z11 runs Android 6.0 Marshmallow and is powered by a Qualcomm Snapdragon 820 processor. The phone comes in two variants – 4GB RAM/64GB storage and 6GB RAM/128GB storage, which can be further expanded up to 200GB via microSD cards. It is not yet clear whether the company will introduce the same handset at IFA, or reveal a new one. The Chinese company also announced that the new smartphone will be unveiled by its co-founder Felix Fu. Apart from ZTE, Samsung will also launch its Gear S3 smartwatch at IFA 2016. The South Korean tech giant has posted invites for an event, scheduled for August 31. The invite, which heavily hints at the Gear S3 launch , shows a clock dial and a text below that reads, ‘Talk About 3,’ followed by ‘Gear’ and the event’s time details. It will be live streamed on Samsung’s website – www.samsung.com/galaxy, at 18:00 CET (11.30 PM IST). For those unaware, Samsung launched the Gear S2 with rotating bezel at last year’s IFA. As per speculations, Samsung’s Gear S3 smartwatch would retain the circular dial design of its predecessor. It is also expected to come with an altimeter, barometer and GPS-based speedometer. A ‘Classic’ variant of the device is also rumoured. Both might run Samsung’s home-grown Tizen OS.